The opportunity of investing in a Franchise business is an exciting time, there is however a process to follow. Below is just about everything you need to make an informed decision about wanting to investigate the Xpresso Delight Franchise business opportunity further. The first step in the process is, we suggest you watch the video* below, it contains detailed information about our unique business model. This video will give you a solid understanding of what is involved and should initially help you decide if you want to progress further down the path of a request for consideration and meeting with one of our Master Agents. It is around 11 minutes in duration, however we believe it will be the best 11 minutes you ever invested in yourself and possible future. How long have you been looking to buy a franchise? Are you looking to buy a franchise within the next three months? Have you ever owned a Franchise before? Do you have funding to purchase a Franchise in place? "Hi, this is Antony and Anne Murry. We joined Xpresso Delight because we are passionate about quality coffee. Our Xpresso Delight franchise allows us to provide great coffee to people in the workplace with exceptional convenience and cost effectiveness. The great training and support from the Qld master agents Stephen and Vivienne Beech gave us a great start, and is enabling us to continue to grow a strong and rewarding business. One of the many rewards for us is showing clients how to have great cafe quality coffee in their workplace. We enjoy the positive feedback we continually get from new and existing clients. It makes our work so enjoyable knowing we are helping so many people experience great quality coffee." "Having sold my previous business, I soon got tired of the idle life. I then identified a set of criteria that I desired from my next business. It had to be a dynamic franchise, one that had good growth potential, which provided flexible working hours and that had a product that I would be proud to sell. After discarding many of the "brand" names, I found that Xpresso Delight fulfilled what I was looking for. With the excellent backup and systems provided by the Master Agent, it has made the transition to Xpresso Delight an absolute pleasure. Some of my customers cannot start the day properly until they have had their "coffee fix", and that satisfaction lingers knowing that you have provided them with an excellent coffee start to the day. " Like to know the Whole Xpresso Delight Story? The American coffee market is growing faster than ever. It's clear that perked coffee is no longer an acceptable beverage for the millions of people who go out of their way every day to achieve the perfect coffee experience. In fact, 83 percent of adults drink coffee in the U.S, the world's biggest consumer of the beverage, up from 78 percent a year earlier, according to the National Coffee Association's 2013 survey. The New York-based group said that 63 percent of adults drink coffee every day, compared with 58 percent in 2011. As the number of savvy, educated coffee drinkers has boomed, the market has exploded in all directions. Boutique companies are setting up all over the country to fill the demand for exciting new flavors of roasted coffee. But it's not just cafes that are reaping the rewards; people want their coffee at home and at the workplace. This may be the best time to be in front of the booming espresso coffee market. As a nation, Americans are drinking more and more espresso coffees and this is becoming the accepted standard. Hundreds of millions of espresso coffees are being consumed every year here and growing substantially every year. That said the interesting element of all this is that these espresso type coffees are consumed by workers going to work or having those coffees in the morning while at work. Virtually all of them are purchased at coffee shops. An incredible number of espresso coffees are consumed by the work force while going to or at work. WOW. Xpresso Delight produces just over 6 million right in the workplace in its origin country at this point in time which represents around two thirds of one percent there. We are the largest independent Australian owned supplier of in the workplace espresso coffee into this market. Less than one percent market share and we are the largest. What does that tell you about this untapped market and the opportunity? That it is massive and waiting for and wanting to experience our unique service. If we look at this from another point of view we get the same interesting opportunity of numbers. Xpresso Delight today has over 180 Franchisees with an average of 9.8 individual coffee machines each, that's a little over 2000 coffee machines making fantastic espresso coffee right in the work place. But how many businesses or Locations are there? Well there are approximately 1 million businesses in Australia, but not all of them can have one of our machines. Why? Because they may be in retail or manufacturing or whatever business that does not allow them our 5 Star Concierge Coffee Service. Our estimates are one quarter of the total number so that takes us to approximately 250,000 businesses that we know potentially want to get our product and service, still a massive number of business opportunities and Locations that are potentially searching for the Xpresso Delight service. Now let's look at the numbers here in the USA. There are approximately 12 million businesses (this number changes all the time) so one quarter of that number represents approximately 3 million potential opportunities for our unique product and service. Again a staggering number. To finish on we estimate that the total corporate espresso in-house market penetration by all suppliers is still less than 5% which means we have in front of us right now a market with a massive 95% growth opportunity. So ask yourself is that the kind of opportunity you would like to be part of? But it gets even better because the market is not static, it is still growing and growing at an incredible pace and it is because of this growth and demand that Xpresso Delight has grown to the level we have and you can now be part of that growth. This pent-up demand for gourmet coffee in the workplace is very poorly met. Each day, thousands of workers trek to the nearest café to spend as much as $3 to $4 for their morning coffee. In many cases they might do that for themselves and their workmates half a dozen times every day! This is a huge market waiting to be tapped. Why would these people repeat this daily trek if they could just walk half-a-dozen steps and get a perfect cup of gourmet coffee in a mere 30 seconds for just a fraction of cafe prices? This is the premise of Xpresso Delight taking quality gourmet coffee into in the heart of the workplace at a fraction of the price that people pay at cafes. For the astute investor, an Xpresso Delight franchise is a unique opportunity to grab a slice of the action in which you'll discover that your investment of time and effort is unbelievably small. Creating wealth is all about generating leverage. Unfortunately, most of us are stuck trading time for money. This usually limits our earning capacity. There are only 24 hours in a day, and most occupations provide a very poor return on time invested. Once you spend your time it's gone forever! With Xpresso Delight, your ability to leverage time shoots through the roof. Roughly, you'd spend 45 minutes per week servicing each of your coffee systems. The average Franchisee in Australia has 9.8 coffee systems so that's approximately 9.1 servicing hours for 10 coffee systems, leaving you the rest of the week to spend on whatever else you want to do, and the best part is your machines are still working, even when you're not! This means you avoid the spirit-breaking labor of many other Franchise opportunities. You're not mowing lawns in the hot sun all day or cleaning homes five days a week to earn a pittance, or stuck trying to coerce sullen employees to do their job properly. In fact, those 10 coffee systems will be generating leverage and working for you not the other way around, far better than other types of franchises where you slave long hours for an average return! Xpresso Delight is a simple business concept that virtually anyone can be successful at. Specifically we transplant the cafe experience into the workplace. You own a number of fully automated gourmet espresso coffee systems that provide a coffee experience equal to any café, but are located directly in the workplace. These coffee systems are given away FREE to businesses who want our incredible service. Franchisees service the coffee systems weekly and provide all the consumables, everything from the coffee to the cappuccino sprinkle and then simply charge their clients an incredibly small $1 per coffee. Each Franchisees commitment is around 30-60 minutes per client per week excluding travel time. The coffee systems we use are manufactured to exacting standards in Switzerland and Italy they are equipped with state-of-the-art technology. They're fully automatic, a breeze to use, and have a patented auto-cappuccino mechanism that produces a hot creamy froth so thick that sugar floats on top of the cup. The coffee systems are fun to use, produce a stunning coffee within 30 seconds, and are wildly popular. They come with a two year parts and labor warranty and are again top of the line equipment that has a proven track record in the market. Our clients tell us they love our service because they have no upfront costs, they sign no finance contracts and because our Franchisees own the coffee system they receive a forever warranty. Most importantly our clients tell us they love our coffee. Workers can finally enjoy the convenience of fantastic-tasting coffee anytime they want. No long walks to the café any more. They can even get one on weekends or late at night when cafés are closed. Our clients also get our 4 hour service guarantee with a replacement coffee system benefit if required. Our Area Representatives hold replacement coffee systems for our Franchisees just in case a problem can't be fixed on the spot. Our Franchisees provide those replacement coffee systems and continue to receive the revenue, the client still gets their coffee, everyone WINS. It's all just part of our great service. Xpresso Delight is generally a one, two or three day a week business which gives you extremely high returns on your time. We provide an intensive training program with ongoing support which means you get our proven market experience whenever you need it. Xpresso Delight has been a success for many people who have never been in business before. Even if you have, our system will just help to accelerate that success. The reasons are because our product and service are greatly in demand and the market is hungry to get it. Success as an Xpresso Delight Franchisee is a formula of simply following our proven systems. A lot of prospective franchisees tell us they feel some concern and anxiety about whether this business will work and more importantly whether the business will work for them. If you have any of these concerns or anxiety please read on. While we think our business is a tremendous success, what matters most is how you feel about what we have achieved over the short term. 1. An international presence with a committed Franchisor driving the business forward. 2. Local Area Representatives who offer support to all Franchisees locally. 3. Over 180 Franchisees Internationally. 4. Over 2000 coffee systems owned by our Franchisee network. 5. We currently provide over 13,000 lbs of coffee per month. 6. This equates to over 550,000 cups of coffee per month. 7. We serve approximately 50,000 individuals per month. Ask yourself what do you think of those results? At Xpresso Delight we firmly believe all these results and strong growth have been built on the back of our brand. Let me tell you what our brand is and what it means to us personally. Our brand and its future is of great importance to Xpresso Delight. It is one of the main reasons many individuals have purchased an Xpresso Delight Franchise. While we have discussed that our business has a formula for success, it still needs to work and be successful for you. RIGHT? Well, we do something a lot different to most business and we think it's totally UNIQUE. But please, tell us if you have heard of this before. Here's what we do, it's called our Franchise Fee Refund Guarantee. First your Franchise fee is deposited into a Trust Account. Your Franchise Fee sits in that Trust Account for six (6) full months. For us to get paid that Franchise Fee the requirement is you must achieve at least a 50% revenue return on your capital investment of coffee systems that are earning revenue in Locations in that six month period. If you DO NOT achieve that result you can possibly get that amount back plus interest. In fact our Franchise Fee Refund Performance System is written up in our Franchise Agreement which you can take away with you when we meet in person so even your lawyer can check our obligation to this incredible System. That said we have never given back a Franchise Fee because we know our system works. What this means to us however is that we DO NOT get paid for that full six (6) month period. We have to work with you to get you that specific result or risk not getting paid at ALL. Have you ever worked for six (6) months and not got paid until the end of the six (6) months? What about not got paid for six (6) months and risking NOT getting paid at ALL? Ask yourself this, WHY do you think we would DO that? It's because we believe so much in our product and service and that the business will work for virtually everyone that we are willing to take this kind of risk. That's right, we take the same kind of risk you take, in fact, our risk is even bigger because we need to make sure you are the kind of person that wants to succeed and will do whatever is necessary to become a successful Xpresso Delight Franchisee. Because a lot of prospective franchisees also tell us they feel some concern and anxiety about how to find Locations for their machines once they do decide to invest in an Xpresso Delight Franchise. If you have any of these concerns or anxiety about finding Locations read on. Most of our Franchisees have had little or no business experience before starting with Xpresso Delight and they have achieved great results. So how do you think they were able to get those great results? Research shows us one of the main reasons for buying into an established successful Franchise group is that you get Proven, Market-Tested Systems that produce results. Would that be one of your reasons? With just over 180 Franchisees in OUR International group now, we find they tend to naturally fall into two groups. One of those groups tends to achieve results, quicker and with more success, while the other group are doing fine there is a difference in the two. Why do you think one group is getting better results and faster? What do you think they do slightly different? They simply follow our system. If fact we call that group our HIGHER ACHIEVER'S group. As most people have had some measure of success in their lives we would assume they would like to be in our HIGHER ACHIEVER'S group? Again what is it that sets that group apart from the other group ? Correct. They follow our system. So ask yourself this, you are you the sort of person who will follow OUR systems to get that possible level of success? If you are read on. Well let's introduce you to our first system, it's called our Customer Location System. This is a brand new system just recently introduced which has been developed from 9 years of previous operational success. We are constantly looking for ways to develop and improve our systems and that is exactly where this one came from. Let us tell you about our previous system and how we developed this new one from that. While our franchisees were getting fantastic results we listened to their feedback and this is what they had to say. With a lot of new systems to learn and implement it was taking a bit longer than they anticipated to achieve their start up goals. So we thought, what could we do to make it ALL happen faster? We now work with you to help introduce YOU to Customer Locations for your START UP coffee systems. You might be thinking how do we do that? We'll we work along side with you before and during training. Also we at times employ what we call a Location Sourcing Assistant. Their job is to identify possible Locations, they are trained in exactly the same marketing program you will be trained in, but because they do this most days their skill set is very fluent. Exactly like yours will be after completing our training program. You now start our marketing training with income potentially flowing along the way. So ask yourself this? How important do you think Marketing is on a scale of 1-100? We see marketing as vitally important. We hope you do too. How do you think a company like McDonalds have become one of the most successful businesses today? By marketing once a year? Once every 6 months? Monthly or DAILY? Every day of course and through every media available. So WHY would a successful company like McDonalds do that? It's because they know the importance of staying in front of buyers minds all the time. McDonalds KNOWS marketing is critically important to success and so do we. Our great marketing systems are what have got us where we are today. We cannot think of a single business that does not have great marketing systems. Do you know of any successful business that has no marketing? We actually call marketing the front end of a business; we say NO front end, NO Back End. The Back End of a business is things like operations and service, but most importantly the REVENUE End. NO Back End equals NO Revenue, which makes the Front End even more critical. That said, we understand how critically important marketing is for ANY business including ours and that is why we have placed so much importance on it. Let's explain what this entails. First, you complete our 2-day in house training, which gives you a basic skill level to start operating. You complete several days of installation and service training. You move to our marketing program where you work FULL TIME for the first 3 weeks operating just like our Location Sourcing Assistant does. You will be reporting daily to our Area Representative in your local area so they can coach and keep you on track. This program gives you real marketing experience and helps develop your ability to further grow your business. This first combined 3 weeks however is critical to get solid momentum and help you to become a Higher Achiever. You move to our ONE a day per month Monthly Marketing Program, which is designed to keep your skill set at that Higher Achiever level. To finish on you now are now fully equipped to continue the growth and development of your business as you see fit. Remember however our support is always there and only a phone call away. Acquiring businesses that want an Xpresso Delight coffee system installed is a skill set that requires training, focus and determination, while there are thousands of quality sites available marketing is an ongoing process where your training and expectations of success will bring you possible results. Business owners love the fact that Xpresso Delight coffee systems improves productivity, their employees aren't wandering off on long breaks several times each day just to fetch coffee. They also don't have to serve their clients perked coffee before a sales presentation or important meetings anymore. And since there's no upfront cost for their business and there's absolutely no risk for them it makes getting a potential client to say, "yes" much easier. This means you're able to concentrate on locating prime sites that are going to provide you the highest returns possible. An Xpresso Delight franchise offers you an amazing opportunity to create your own business and generate high leverage on your time. Yet at the same time, you're able to tap into the support of experienced professionals who have done it all before. You'll discover that everything is systemized to make learning easy and fast, so you have more time to concentrate on customer service and profitability. We'll help you develop a business plan that will bring your goals into focus, and train you in how to operate and service your machines. We also help you develop the necessary business, sales and marketing skills to manage and grow your business to whatever level you want to achieve as long as you take responsibility to drive your business there. And with the market so fresh and unsaturated, you'll be able to go out and seize the opportunity with both hands. In the past franchises have been complex, time intensive ventures. Not Xpresso Delight! In fact, Xpresso Delight is as close to a passive income earner as you'll find in franchising. Nothing else in the market offers such a fantastic opportunity to earn so much for such a small investment of time. Couple this with a rate of return that leaves most investments far behind, and we think you'll agree that this is a unique business proposition with amazing potential. We've received your Request for Consideration, it's time to begin the process. This is a great chance for us to get to know each other and understand what you are looking for in a Franchise? Outline of our Franchise System and our love of coffee. You will get to experience first hand our stunning coffee systems and fabulous coffee. Receive our Franchise Disclosure Document (FDD) emailed to you. Our Franchise Disclosure Document (FDD) is an important part of the education process and provides everything you need to know about becoming an Xpresso Delight Franchise. Complete Information Request Form (online) within 48 hours of phone appointment. This MUST be completed prior to your Franchise Information Session. Review our Franchise Disclosure Document (FDD). Revisit our Website. (all content including Videos, Location and Franchisee testimonials). Bring along your questions to get in-depth answers. Start reviewing possible Lending and Financial options. It's time for us to show you how Xpresso Delight may be the solution you're looking for. Our NO OBLIGATION Franchise Information Session gives you all the answers. Learn more about our 10 year history and what has made us so successful. 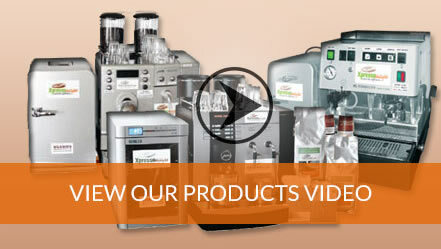 See a live demonstration of all our Coffee Systems in action. Taste test our exclusive 100% Arabica gourmet coffee blend. Complete Self Assessment Form (online) within 48 hours of Information Session. This MUST be completed prior to your Location Experience. Don't just take our word for it, we take you to visit one of our existing clients. See our stunning Coffee Systems in action. This is a chance to meet real market Xpresso Delight ambassadors. This is our real point of difference in the market, it's what sets us apart from the rest. Experience how easy our Coffee Systems are for Franchisees to service. opportunity to review your application and suitability as a potential Franchisee. It is time for both of us to start finalising our due diligence processes. Is Xpresso Delight the exciting business solution you are looking for? Speak with our existing Franchisees and see why they chose Xpresso Delight. Finalise how to finance your Franchise and Equipment. Xpresso Delight conducts its due diligence on your application. driven, passionate and have a massive desire to succeed. Do YOU? Do you have what it takes to be awarded an Xpresso Delight Franchise? Once your application is approved we move to Franchise Agreement signing. We welcome you to the Xpresso Delight Team and schedule final Training dates. To invest in an Xpresso Delight Franchise requires an investment of time and funding. Have you considered how you will fund the Franchise investment? You can talk to your local Area Representative about funding options. An Xpresso Delight Franchise is currently from $67,900 plus any applicable sales tax. We are also offering a start up Bonus Package of Stock (approximate profit value $5,000) for a Limited time. Talk to your local Area Representative for more details. *Video provided in this website page was produced in mid 2010 the market, opportunity and other elements of this video will possible differ from statements contained therein. You should conduct your own investigation and analysis of the business opportunity, market, data and information contained herein and seek professional advice. **Franchise Fee Refund Performance System is outlined in full in the Franchise agreement and the Operations Manual and subject to conditions specified there. ^Customer Location System does not apply to Regional Franchise purchases outside of Metro areas. Regional Franchise purchases have a different start up System, which your local Area Representative will outline if this type of Franchise applies to you. The information contained in this website has been compiled solely for information purposes to assist in making your own evaluation of the business opportunity. It does not purport to contain all of the information you may require. You should conduct your own investigation and analysis of the business opportunity, market, data and information contained herein and seek professional legal advice. None of N Lee Global Franchise Group, LLC, it's subsidiaries and or associated companies, employees, officers or agents makes or gives any representation, guarantee or warranty as to the accuracy or completeness of the information contained in this website and none of such persons will have any liability whatsoever for any direct indirect or consequential injury, loss or damage that you or any other person may suffer arising from any information or matters contained in or derived from, or for any omissions from, or failure to correct any information in, this website or any written or oral communications to you in relation to the business opportunity. Whilst every effort has been made to ensure that the information provided in this website is free from error or omission N Lee Global Franchise Group, LLC assumes no responsibility for the interpretation of the subject matter herein. The information contained in this website is not a substitute or intended as a source of legal or accounting advice. The information contained herein may be subject to varying Federal, State and/or Local government regulations. We advise the retention of competent counsel in determining what if any regulations apply to various individual businesses. The use of this material and information by the reader or purchaser assumes all responsibility to applicable laws and regulations for all governments including Federal, State and Local. All aspects of doing business in USA is the sole responsibility of the reader or purchaser. N Lee Global Franchise Group, LLC assumes no responsibility or liability whatsoever on behalf of the reader or purchaser for this material and information. We do not guarantee any results you may or may not get by following recommendations contained herein.